Ever since I was very young, I have thought of trees as tall grandparents of sorts, who watch over, guide, and protect us. Growing up in the country gave me the opportunity to develop a closer relationship with them by spending time climbing and touching them. During road trips we would often take to Mérida and other places, I used to love looking out the window and gazing at their different shapes, leaves, flowers, colors, and changes depending on the season. I had favorite trees and couldn’t wait to see them “pass by” along the road. My dad has told me a lot about the many properties of the “jabín” tree (Piscidia piscipula (L) Sarg.) as it is called in Maya. Jabín trees can be up to 20 meters tall, and their trunks twist into all sorts of shapes with a rough, cracked bark. 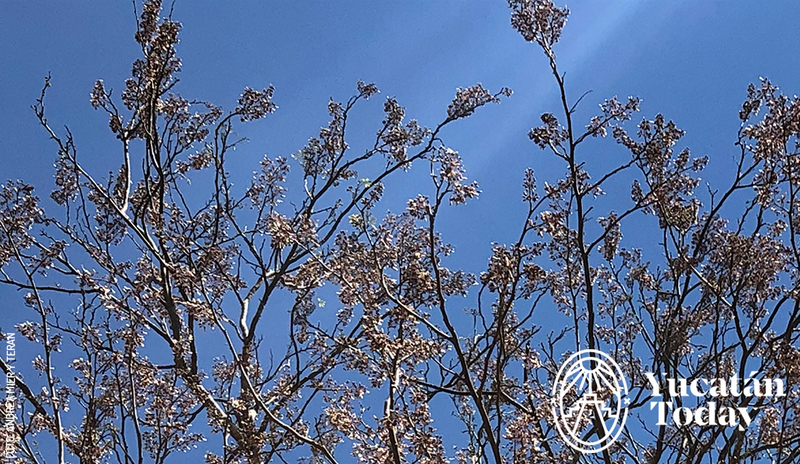 It’s especially easy to identify a jabín tree during the spring, because between February and May it’s full of small white, pink, or purple flowers. When the tree is in bloom, it yields the treasured “jabín honey;” a high quality light-colored honey that doesn’t crystallize. The Maya use it to sweeten “pozole,” a refreshing beverage made out of corn flour, lime, and water; but it can also be made savory by adding a pinch of salt. The honey is also used in soothing colds and sore throats, and healing cuts and burns. Grateful birds safely build their nests in the jabín’s strong branches, and in return they spread its seeds ensuring the continuation of its life cycle. The jabín tree is also highly valued by artisans who build furniture, figurines, and other artifacts with its wood. Its striking grain and “stripes” reflect years of life and strength. However, such beauty and sweetness falls short in comparison to what lies within. Jabín is also a hardwood which is important to construction. It is used to make pillars for homes and beams for roofs. If you take a look at how a traditional Maya home is built, you will see this tree’s importance in creating the structure. It is also used to make poles that withstand great weights. It’s sturdy enough to keep wagon wheels in place, and because it is bendable, it is also used in shipbuilding. 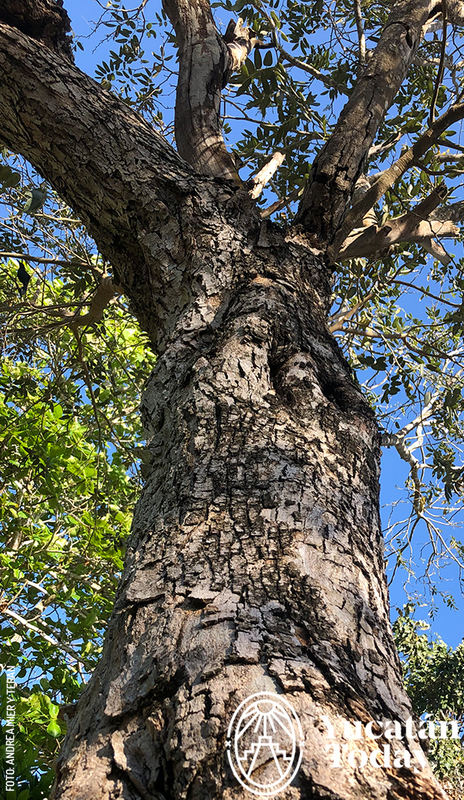 Since ancient times, the Maya have utilized the jabín tree’s multiple properties well and they have passed their knowledge on from generation to generation through oral tradition. In the villages, jabín is also used for firewood and heating because it consumes slowly. Logs are burnt on top of a metal sheet, under hammocks to keep the house nice and warm. This is why jabín wood is considered “magical.” Did you know that once you light it as firewood, you can later put it out so that it doesn’t continue burning…and then you can light it again just by fanning it? This is something few people know, but thanks to our ancestors’ knowledge, the tradition has stayed with us and is still a common practice today. My dad tells stories of how sailors would marinate pork meat with smoked jabín, oak, and guava leaves for up to sixty days. Currently, jabín leaves are being studied for their medicinal properties as a sedative and in the treatment of respiratory conditions. Who would have thought the beautiful jabín is all this? Learn more about this beautiful tree and enjoy its many properties by asking someone about it next time you’re visiting one of our region’s villages. Who can tell us how much it will rain? 2012: The Maya and the world did not end!